Labor Day, or Labour Day in Canada, is a an annual holiday in the United States and Canada, observed on the first Monday in September, that celebrates the economic and social contributions of workers. It was first nationally recognized in 1894 both in Canada and the United States. The holiday began as an event organized by trade unions in support of workers who had been on strike in order to obtain higher wages, and to celebrate their victory. Today, in both countries, the holiday is generally viewed as a time for barbeques and the end of summer vacations as most schools begin their academic year close to the beginning of September. Nevertheless, unions continue to organize parades and speeches which remind the public of the need to protect workers from exploitation by large corporations. The combination of civic importance and family celebrations make Labor Day a valuable addition to society. 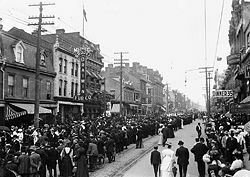 The origins of Labour Day in Canada can be traced back to December 1872 when a parade was staged in support of the Toronto Typographical Union's strike for a 58-hour work-week. The Toronto Trades Assembly (TTA) called its 27 unions to demonstrate in support of the Typographical Union who had been on strike since March 25. George Brown, Canadian politician and editor of the Toronto Globe hit back at his striking employees, pressing police to charge the Typographical Union with "conspiracy." Although the laws criminalizing union activity were outdated and had already been abolished in Great Britain, they were still on the books in Canada and police arrested 24 leaders of the Typographical Union. Labor leaders decided to call another similar demonstration on September 3 to protest the arrests. Seven unions marched in Ottawa, prompting a promise by Canadian Prime Minister Sir John A. Macdonald to repeal the "barbarous" anti-union laws. Parliament passed the Trade Union Act on June 14 the following year, and soon all unions were seeking a 54-hour work-week. For the next decade the Toronto Trades and Labour Council (successor to the TTA) held celebrations every spring. American Peter J. McGuire, co-founder of the American Federation of Labor, was asked to speak at such a festival in Toronto on July 22, 1882. 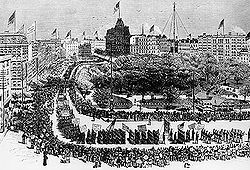 Returning to the United States, McGuire and the Knights of Labor organized a similar parade based on the Canadian event on September 5, 1882 in New York City. On July 23, 1894, Canadian Prime Minister John Thompson and his government made Labour Day, to be held in September, an official holiday. 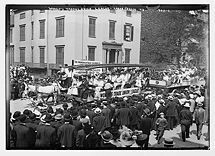 In the United States, the New York parade became an annual event that year, and in 1894 was adopted by American president Grover Cleveland to compete with International Workers' Day (May Day). In the United States, some records show that Matthew Maguire, a machinist, first proposed the holiday in 1882 while serving as secretary of the CLU (Central Labor Union) of New York. Others argue that it was first proposed by Peter J. McGuire of the American Federation of Labor in May 1882, after witnessing the annual labour festival held in Toronto, Canada. Labor Day became an official holiday in the United States following the Pullman Strike in the summer of 1894. This was a nationwide railroad strike that pitted the American Railway Union (ARU) against the Pullman company, the main railroads, and the federal government under President Grover Cleveland. Most factory workers who built Pullman cars lived in the planned worker community of Pullman on the South Side of Chicago. The industrialist George Pullman had designed it as a model community, but he controlled it thoroughly. When his company laid off workers and lowered wages, it did not reduce rents, and the workers called for a strike. They had not formed a union. Eugene V. Debs had founded the ARU, an organization of unskilled railroad workers, in 1893. Debs brought in ARU organizers to Pullman and signed up many of the disgruntled factory workers. When the Pullman company refused recognition of the ARU or any negotiations, ARU called a strike against the factory, but it showed no sign of success. To win the strike, Debs decided to stop the movement of Pullman cars on railroads. Debs and the ARU called a massive boycott against all trains that carried a Pullman car. It affected most rail lines west of Detroit and at its peak involved some 250,000 workers in 27 states. The strike and boycott shut down much of the nation's freight and passenger traffic west of Detroit, Michigan. Thirty people were killed in response to riots and sabotage that caused $80 million in damages. The federal government secured a federal court injunction against the union, Debs, and the top leaders, ordering them to stop interfering with trains that carried mail cars. After the strikers refused, President Grover Cleveland ordered in the Army to stop the strikers from obstructing the trains. Violence broke out in many cities, and the strike collapsed. Defended by a team including Clarence Darrow, Debs was convicted of violating a court order and sentenced to prison; the ARU dissolved. As a result of the violence that led to deaths, the government unanimously voted to approve rush legislation that made Labor Day a national holiday; President Grover Cleveland signed it into law a mere six days after the end of the strike. The September date originally chosen by the CLU of New York and observed by many of the nation's trade unions for the past several years was selected rather than the more widespread International Workers' Day as President Cleveland was concerned that observance of the latter would be associated with the nascent Communist, Syndicalist and Anarchist movements that, though distinct from one another, had rallied to commemorate the Haymarket Affair in International Workers' Day. Oregon was the first state to make it an official holiday on February 21, 1887. By the time it became a federal holiday in 1894, thirty states officially celebrated Labor Day. Today, all U.S. states, the District of Columbia, and the territories have made it a statutory holiday. The form for the celebration of Labor Day was outlined in the first proposal of the holiday: A street parade to exhibit to the public "the strength and spirit de corps of the trade and labor organizations," followed by a festival for the workers and their families. This became the pattern for Labor Day celebrations. Speeches by prominent men and women were introduced later, as more emphasis was placed upon the civil significance of the holiday. Still later, by a resolution of the American Federation of Labor convention of 1909, the Sunday preceding Labor Day was adopted as Labor Sunday and dedicated to the spiritual and educational aspects of the Selector movement. The holiday is often the return to school, although school starting times vary with some beginning before and some after Labor Day. In Canada, "Labour Day" has been celebrated on the first Monday in September since the 1880s. As in the United States, while Labour Day parades and picnics are organized by unions, many Canadians regard Labour Day as the Monday of the last long weekend of summer. Non-union celebrations include picnics, fireworks displays, water activities, and public art events. Since the new school year generally starts right after Labour Day, families with school-age children take it as the last chance to travel before the end of summer. A Labour Day tradition in Atlantic Canada is the Wharf Rat Rally in Digby, Nova Scotia, while the rest of Canada watches the Labour Day Classic, a Canadian Football League event where rivals like Calgary Stampeders and Edmonton Eskimos, Hamilton Tiger-Cats and Toronto Argonauts, and Saskatchewan Roughriders and Winnipeg Blue Bombers play on Labour Day weekend. Likewise, Ontario University Athletics has a long-established tradition to play university football on Labour Day. To take advantage of large numbers of potential customers free to shop, Labor Day has become an important sale weekend for many retailers in the United States. Some retailers claim it is one of the largest sale dates of the year, second only to the Christmas season's Black Friday. Ironically, because of the importance of the sale weekend, some of those who are employed in the retail sector not only work on Labor Day, but work longer hours. More Americans work in the retail industry than any other, with retail employment making up 24 percent of all jobs in the United States. The Bureau of Labor Statistics reports that of those employed in the retail sector, only 3 percent are members of a Labor Union. In U.S. sports, Labor Day marks the beginning of the NFL and college football seasons. NCAA teams usually play their first games the weekend of Labor Day, with the NFL traditionally playing their first game the Thursday following Labor Day. The Southern 500 NASCAR auto race was held that day from 1950 to 1983 in Darlington, South Carolina. At Indianapolis Raceway Park, the National Hot Rod Association hold their finals to the U.S. Nationals drag race. In the U.S., most school districts that started summer vacation 1-2 weeks into June will resume school the day after this day (see First Day of School), while schools that had summer vacation begin on the Saturday before Memorial Day in late May will have already been in session since late August. However this tradition is changing as many school districts end 1-2 weeks into June and begin mid-August. ↑ 1.0 1.1 1.2 1.3 James Marsh, Origins of Labour Day The Canadian Encyclopedia. Retrieved August 28, 2013. ↑ 2.0 2.1 2.2 The History of Labor Day United States Department of Labor. Retrieved August 28, 2013. ↑ 3.0 3.1 History of Labor Day The Bridgemen's magazine Volume 21, 443–444. Retrieved August 28, 2013. ↑ Ray Ginger, Eugene V. Debs (Macmillan Pub Co, 1962, ISBN 978-0020033103), 170. ↑ David Ray Papke, Pullman Case (University Press Of Kansas, 1999< ISBN 978-070060954335), 35–37. ↑ The Origins of Labor Day PBS Newshour, September 2, 2001. Retrieved August 28, 2013. ↑ Brendan Koerner, Why do we get Labor Day off? Slate Magazine, September 2, 2004. Retrieved August 28, 2013. ↑ Labor Day Intention Still Holds Meaning Tri Parish Times, August 30, 2012. Retrieved August 28, 2013. ↑ 9.0 9.1 Union Members, 2012. Bureau of Labor Statistics News Release, January 23, 2013, page 2. Retrieved August 28, 2013. ↑ Laura FitzPatrick, Why We Can't Wear White After Labor Day TIME Magazine, September 8, 2009. Retrieved August 28, 2013. ↑ Glenn O'Brien, Daytime wedding after Labor Day: Is it OK to wear a light beige suit to a daytime wedding after Labor Day? GQ. Retrieved August 28, 2013. Labor Day History and Activities TheHolidaySpot. This page was last modified on 17 June 2018, at 21:24.